Will Monster's Buyout Dreams Finally Come True? Shares of Monster Beverage jumped as much as 8.7% on Friday, despite a lack of company news. The catalyst was a well-worn old hobbyhorse. Rumor has it that Coca-Cola is getting ready to buy the energy drink specialist. Maybe the time is finally right for a move like that, too. Monster, nee Hansen Natural, was one of the market's most explosive growth stocks in the late 1990s, early 2000s. But the energy drink market has matured, growth is moderating, and Monster could be excused for looking at exit strategies at this point. 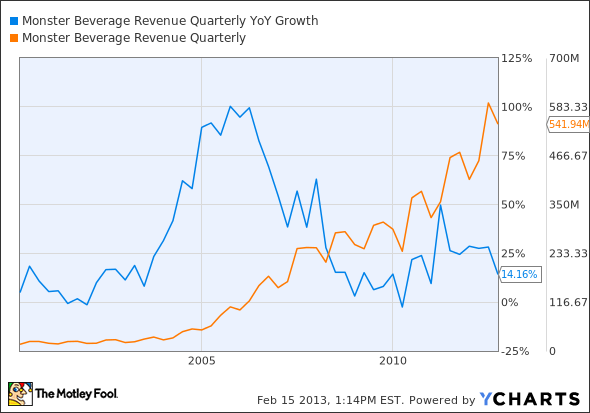 MNST Revenue Quarterly YoY Growth data by YCharts. Sales are still growing, which makes Monster an attractive buyout target for Coke or some other major foodstuffs vendor. But the days of doubling revenue year over year are fading in the rearview mirror, and not coming back. Monster is great at what it does, but a proven one-trick pony nonetheless. With an $8.1 billion enterprise value plus a reasonable buyout premium in the 30% range, Monster would cost something like $10 billion when all is said and done. That would be Coke's largest deal since taking its own North American bottling network in-house for $12 billion in 2010 and easily the largest product-focused buyout in company history. But Coke would enjoy some synergies from its existing distribution arrangement with Monster, and the energy drink market has been a notriously difficult nut to crack for anyone not named Monster or Red Bull. And it's not like massive deals are unheard of in this industry -- recall PepsiCo's $15 billion takeout of Quaker Oats at the turn of the millennium, and a Monster-size deal starts to look reasonable. That's not to say that the rumors definitely will come true this time. But this end game has never made more sense than it does now. The stakes are high for Monster Beverage these days. The stock had been nothing short of a rocket, but recent developments have sent shares spiraling downward. Health scares sparked a number of investigations at the state and federal level into the energy drink's role in several fatalities. With the company's value slashed in half, investors are wondering whether Monster Beverage is a value or a bust in the fast-growing energy drink category. Find out now in our premium research report, which details all the ins and outs you need to know about Monster Beverage, and even comes with a full year of updates to boot. Click here now to claim your copy and start reading today. The article Will Monster's Buyout Dreams Finally Come True? originally appeared on Fool.com. Fool contributor Anders Bylund holds no position in any company mentioned. Check out Anders' bio and holdings or follow him on Twitter and Google+. The Motley Fool owns shares of PepsiCo. Motley Fool newsletter services have recommended buying shares of PepsiCo, Coca-Cola, and Monster Beverage. The Motley Fool has a disclosure policy. We Fools may not all hold the same opinions, but we all believe that considering a diverse range of insights makes us better investors. Try any of our Foolish newsletter services free for 30 days.